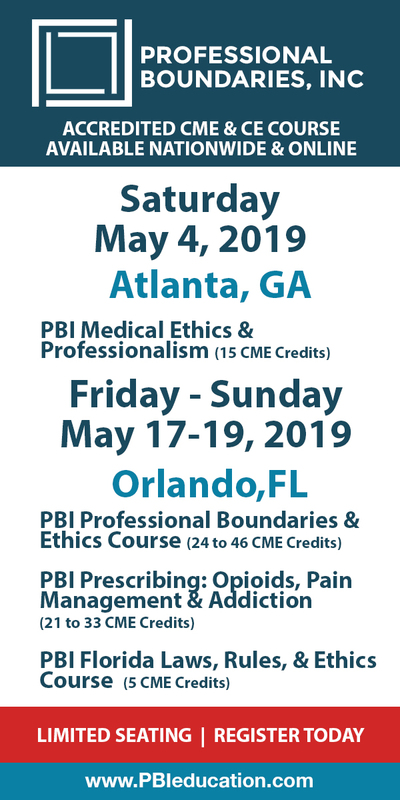 PBI Prescribing: Opioids, Pain Management, and Addiction (RX-21) is organized by Professional Boundaries, Inc. (PBI) and will be held from May 18 - 19, 2019 at Wyndham Irvine-Orange County Airport, Irvine, California, United States of America. Course Credit: 21 CME/CE hours Summary: More than just a course in sound prescribing practices, this course reaches beyond. We examine the personal and professional reasons why clinicians fail to prescribe properly. Both broad and deep, the curriculum covers common misconceptions about opioids, assessment of patients for misuse potential, setting prescribing-related boundaries, team-based pain management approaches, and compliance with documentation, laws, and rules. In addition, and building on insights into why clinicians prescribe inappropriately, participants develop a Personalized Protection Plan. This plan is designed to help them maintain their newfound knowledge base and prevent prescribing-related lapses. Professions this course is suitable for: Prescribers from all disciplines will benefit from this course. This course addresses issues such as: • Inappropriate or unsafe prescribing of CDS • Inadequate treatment and management of patients with chronic pain • Documentation that does not comply with laws and regulations • Poor understanding of drug dependence, addiction, and abuse potential Learning objectives: • Implement safer, more effective treatment with improved outcome through the application of a comprehensive knowledge of the spectrum of pain medications • Apply the prescribing laws and regulations into clinical practice for the safe and effective use of opioids and controlled substances • Produce and maintain medical records documenting compliance prescribing laws and documenting appropriate management and treatment of chronic pain • Differentiate opioid dependency and addiction to minimize abuse potential and maximize pain management Additional details will be posted as soon as they are available. Assessment and Treatment of Children with Oral Motor, Feeding/Swallowing and Respiratory Function Challenges: Children with Neuromuscular Involvement Session 3 is organized by Education Resources, Inc. (ERI) and will be held from Jun 07 - 09, 2019 at Irvine, California, United States of America. Course Description: This course delivers clinically relevant assessment and treatment strategies for infants and children with neuromuscular impairments and challenges to their oral motor, feeding/swallowing and respiratory function. A special emphasis is on postural alignment and control as well as on sensory factors that can influence a childs feeding and swallowing. 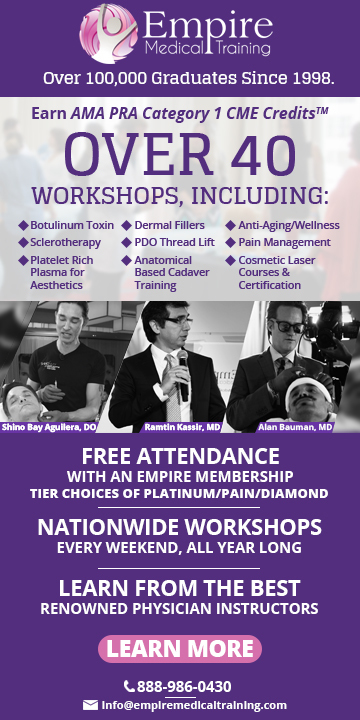 Effective treatment strategies to improve cheeks/lips, tongue, jaw and rib cage function will be highlighted. Participants will engage in extensive clinical problem-solving via group case analysis and patient demonstration sessions. Participants will be able to apply course learning immediately to: • Clinically assess oral motor, feeding/swallowing and respiratory coordination function in infants and young children • Detail the essential components of comprehensive intervention programming for young children with neuromuscular involvement • Implement effective handling and positioning for the modification of oral motor, oral-pharyngeal and respiratory function in intervention programming • Perform treatment strategies to improve the function of the cheeks/lips, tongue, jaw and rib cage in children with neuromuscular involvement Additional details will be posted as soon as they are available. PBI Professional Boundaries and Ethics: Essential Edition (PB-24) is organized by Professional Boundaries, Inc. (PBI) and will be held from Jun 21 - 23, 2019 at UCI Student Center & Event Services, Irvine, California, United States of America. Course Credit 24 CME/CE hours Summary Our suite of Professional Boundaries and Ethics courses employ the premise that everyone has the potential to commit a boundary or ethics violation—yet not everyone does. As in many other similar boundaries and ethics courses, participants learn why they are being held to account. But in our course participants are guided to open their eyes to what predisposed them to violate professional or ethical norms at the particular time and in the particular manner that they did. These learnings drive an intensive process of self-assessment and introspection, culminating in the development of a Personalized Protection Plan that each participant designs to avoid future wrongdoing, safeguard patients and colleagues, and honor the reputation of their profession. Professions this course is suitable for: Physicians, dentists, veterinarians, chiropractors, physician assistants, nurses, mental health providers, EMT's, physical therapists, students, and a wide variety of other clinicians. This course addresses issues such as: • Professional misconduct • Non-Sexual and sexual boundary violations • Workplace relationships and disruptive behavior • Recognizing power imbalances • General boundary crossing & violations • Board-mandated or anticipated disciplinary action • Team or clinical communication issues Learning objectives • Express why and how healthcare professionals are held accountable for adhering to standards of practice, codes of ethics, and state statutes • Discuss attributes and behaviors that constitute professionalism in the context of health care, and identify specific lapses in their own professionalism • Explain how professional problems evolve, employing the model of a continuum of boundary impingements • Express how professional lapses can adversely affect clinical judgment and cause a range of other impacts and harms • Describe the components of the Boundary Formula™ and apply them to their own violation potential and, if applicable, their infraction • Create and implement a Personalized Protection Plan that includes strategies, safeguards, and systems to reduce the risk of relapse and improve accountability • Detect early warning signs of professional problems in themselves and others in order to reduce the risk of future violations Additional details will be posted as soon as they are available. PBI Professional Boundaries and Ethics: Enhanced Edition (PB-24EN) is organized by Professional Boundaries, Inc. (PBI) and will be held from Jun 21 - 23, 2019 at UCI Student Center & Event Services, Irvine, California, United States of America. Course Credit 34 CME/CE hours Summary With pre-seminar preparation in addition to the three-day in-person course, the Enhanced Edition offers a comprehensive educational experience. The 10-hour pre-course, consisting of readings and written exercises, prepares participants for the conceptual, emotional, and practical work that will occur in the seminar. Our suite of Professional Boundaries and Ethics courses employ the premise that everyone has the potential to commit a boundary or ethics violation—yet not everyone does. As in many other similar boundaries and ethics courses, participants learn why they are being held to account. But in our course, participants also open their eyes to what predisposed them to violate professional or ethical norms at the particular time and in the particular manner that they did. These learnings drive an intensive process of self-assessment and introspection, culminating in the development of a Personalized Protection Plan that each participant designs to avoid future wrongdoing, safeguard patients and colleagues, and honor the reputation of their profession. Professions this course is suitable for: Physicians, dentists, veterinarians, chiropractors, physician assistants, nurses, mental health providers, EMT's, physical therapists, students, and a wide variety of other clinicians. This course addresses issues such as: • Professional misconduct • Non-Sexual and sexual boundary violations • Workplace relationships and disruptive behavior • Recognizing power imbalances • General boundary crossing & violations • Board-mandated or anticipated disciplinary action • Team or clinical communication issues Learning objectives • Express why and how healthcare professionals are held accountable for adhering to standards of practice, codes of ethics, and state statutes • Discuss attributes and behaviors that constitute professionalism in the context of health care, and identify specific lapses in their own professionalism • Explain how professional problems evolve, employing the model of a continuum of boundary impingements • Express how professional lapses can adversely affect clinical judgment and cause a range of other impacts and harms • Describe the components of the Boundary Formula™ and apply them to their own violation potential and, if applicable, their infraction • Create and implement a Personalized Protection Plan that includes strategies, safeguards, and systems to reduce the risk of relapse and improve accountability • Detect early warning signs of professional problems in themselves and others in order to reduce the risk of future violations Additional details will be posted as soon as they are available. PBI Professional Boundaries and Ethics: Extended Edition (PB-24EX) is organized by Professional Boundaries, Inc. (PBI) and will be held from Jun 21 - 23, 2019 at UCI Student Center & Event Services, Irvine, California, United States of America. Course Credit 46 CME/CE hours Summary The Extended Edition is the most comprehensive option in the suite of boundaries courses. Through pre-seminar preparation and post-seminar follow-up, this edition of the course benefits participants in two ways. The 10-hour pre-course, consisting of readings and written exercises, prepares participants for the conceptual, emotional, and practical work that will occur in the seminar. And the weekly, telephonic post-course Maintenance and Accountability Seminars reinforces what was learned in the classroom, elevates participants accountability through revisiting their Personalized Protection Plans, and engages them in a community of peer review and support. The suite of Professional Boundaries and Ethics courses employ the premise that everyone has the potential to commit a boundary or ethics violation—yet not everyone does. As in many other similar boundaries and ethics courses, participants learn why they are being held to account. But in this course, participants also open their eyes to what predisposed them to violate professional or ethical norms at the particular time and in the particular manner that they did. These learnings drive an intensive process of self-assessment and introspection, culminating in the development of a Personalized Protection Plan that each participant designs to avoid future wrongdoing, safeguard patients and colleagues, and honor the reputation of their profession. Professions this course is suitable for: Physicians, dentists, veterinarians, chiropractors, physician assistants, nurses, mental health providers, EMT's, physical therapists, students, and a wide variety of other clinicians. This course addresses issues such as: • Professional misconduct • Non-Sexual and sexual boundary violations • Workplace relationships and disruptive behavior • Recognizing power imbalances • General boundary crossing & violations • Board-mandated or anticipated disciplinary action • Team or clinical communication issues Learning objectives • Express why and how healthcare professionals are held accountable for adhering to standards of practice, codes of ethics, and state statutes • Discuss attributes and behaviors that constitute professionalism in the context of health care, and identify specific lapses in their own professionalism • Explain how professional problems evolve, employing the model of a continuum of boundary impingements • Express how professional lapses can adversely affect clinical judgment and cause a range of other impacts and harms • Describe the components of the Boundary Formula™ and apply them to their own violation potential and, if applicable, their infraction • Create and implement a Personalized Protection Plan that includes strategies, safeguards, and systems to reduce the risk of relapse and improve accountability • Detect early warning signs of professional problems in themselves and others in order to reduce the risk of future violations Additional details will be posted as soon as they are available.